I develop Bayesian methods to draw inferences from genetic data about the action of selection and population history and gene flow in shaping the distribution of genetic variants. In particular I am investigating methods to take into account the patterns of spatial autocorrelation in allele frequencies, and in using systems-biology networks to construct prior probability distributions on genetic co-variances. Approximate Bayesian computation (ABC) is proving very effective in many areas of genetics in dealing with the wide variety of parameters that affect genetic variation. However, I am also interested in the merits an alternative approach: of making explicit simplifying assumptions, which are computationally convenient, but (arguably) no less realistic than those implicit in alternative methods. I work on a joint project with Bill Sherwin at UNSW Sydney, Clare Holleley & Gianluca Maio on a project on the effcts of gene flow in lab Drosophila populations. The results suggest that genetic divergence throughout the genome is constrained, to an unanticipated degree, by the action of selection a adjacent loci. 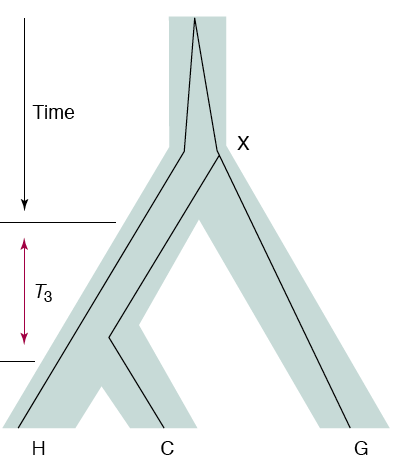 James Cotton and I are working with PhD student Vernonica Comper on phylogeographic inference and problems of calibrating the molecular clock, particularly the long times to common ancestry between two lineages in common ancestor of two species (E.g. the figure illustrates the way that gene trees in Human Chimp Gorilla ancestry may not reflect the species tree). A further PhD student, Bob Verity, is working on Bayesian methods for characterising the isolation-by-distance in the distribution of genetic variation in natural populations. 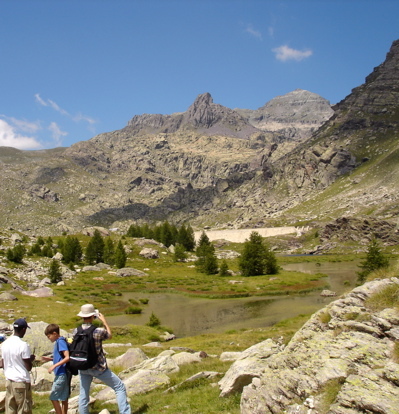 The methods we have used to study gene flow between populations can also be used to investigate themovement of DNA sequences from one part of the genome to another, to study the propagation of viruses within the human body, their spread from one individual to another, and even the transmission of viruses from species to species. I collaborate with Judy Breuer at UCL on the evolution of varicella zoster virus, including the evolution of the live vaccine within the body of vacinees. Our latest project uses a Bayesian analysis of the DNA sequence obtained from virus in different patients to work out transmission routes (who infected whom). The figure shows an abrupt decline in infection rate coinciding with the date of the school holidays. These theoretical approaches enable the use of genetic data to guide the management of wild populations. I am working on two main areas: the role of introduced disease in European frog populations and the conservation of endangered species on Mauritius. In both cases I am lucky to be able to collaborate with, and be guided by, experts working directly on the biology of the species in question. Trent Garner at the Institute of Zoology is interested in genetic diversity and its importance for a species’ response to pathogens. 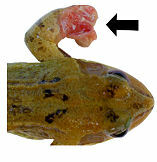 We have two PhD students Stephen Price and Amanda Duffus working on the decline in frog populations. We are using historical records and genetic data to characterize the spatial pattern of genetic diversity in a virus affecting frogs (Figure) that recently invated the UK and to infer the dynamics of transmission between populations. 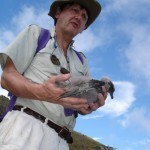 Carl Jones (pictured) of the Mauritian Wildlife Foundation has been instrumental in several successful conservation projects on the island. 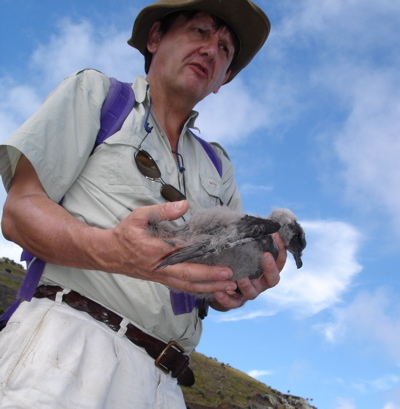 We have had PhD students working on the works on the origins and hybridization of different petrel taxa on one of the outlying islands. She is a CASE student with the Institute of Zoology. Paris Veltsos obtained extraordinary data showing that the populations in and around the zone show dramatic differences in the number and location of rDNA tandem arrays. More at his site. Andrew Leitch and his team work on plant polyploidy at QMUL. We share insights from our studies of different types of hybrization. In particular the hybridization that initiates allopolyploidy and that occurring in the hybrid zone. One common theme is the highly unusual evolution of rDNA in both cases. Ex- postdocs Ioana Marquier and Irene Keller continue to collaborate on the project. Irene has discovered ancient rDNA pseudogenes, dated by Ioana at several million years old. Irene has also shown that the sequence composition of the rDNA appears just as dynamic as the variation in location found by Paris, but with no obvious correlation between the two.